We have a full service Performance Installation Center~! At Scram Speed, we have the experience and equipment to make your performance dreams a reality. We have the know-how for that conventional repair shops don't. 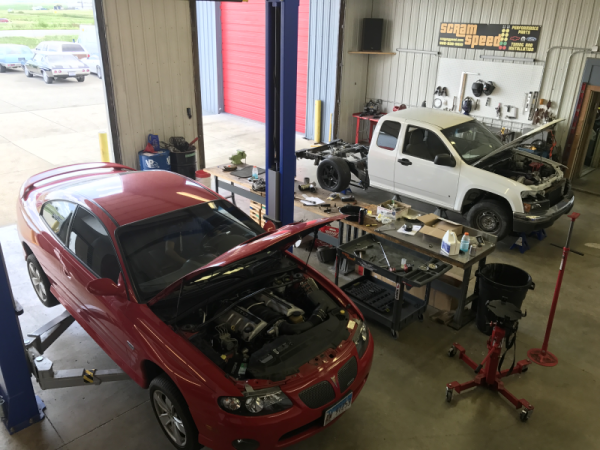 We do all sorts of performance-oriented work, including camshaft installations, headers and exhaust, engine swaps, EFI installations and conversions, and power adder installations. Have something unusual in mind? Let us know, we can help! We do wiring! If you're after a clean and safe installation of your aftermarket electronics, get with us. Remember: We don't stop at just installing the parts, our tuning experts and dyno services will make sure your car or truck is running right! Best of all, we keep it reasonable. Our shop labor rate is $75/hr and we only bill for the actual hours involved. Either give us a call at 855-896-5263 or fill out the form below. We want to be part of your project!